I’ve never really had much positive to say about British rap, or rap at all for that matter, but Gideon Conn’s unique sound is certainly refreshing for someone whose sensitive ears have only ever been subjected to the likes of Dizzee Rascal an’ Blazin’ Squad. 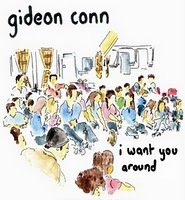 So yes, I admit it, I don’t know much about rap but I do know that Gideon Conn is something special. He has the air of G. Love and Special Sauce about him – relaxed lounge guitars, brassy production and bouncy keys. It’s the kind of rap that you wouldn’t mind your Gran hearing; inoffensive, yet blisteringly original. Now, a bit about the man himself. To put it simply Gideon is a bit of an oddball. If you’ve ever had the pleasure of seeing his live shows you’ll know he’s that strange thing; a musician that hasn’t yet become disillusioned with life. In a way his lyrics fit in with this, they are simple and honest. Like a Manchester-born rapping Daniel Johnston he manages to put what he wants to say simply, albeit with haste. This simplicity pays dividends. The characteristically quirky ‘Trademark’ sums up everything that makes this EP so worth listening to; its lyrically simple, musically upbeat and brilliantly produced, but most importantly it is probably the catchiest thing you’ve heard since Daphne & Celeste released U.G.L.Y.